our rooms open out to the great outdoors. Each room has a private bath with hot water, free access to internet and great cross ventilation. Accommodations in La Ceiba at the Hotel La Villa de Soledad Bed and Breakfast are spacious, comfortable and cool. Our accommodations include high cathedral like ceilings, an extra quiet ceiling fan, natural cross ventilation, and complimentary broad band wifi. You can choose between a bedroom with two full size beds, which can accommodate up to 4 persons or a room with one queen size bed for a maximum of two persons per room. Each room has its own private bath with a hot water shower with plentiful water; you will hate getting out of our showers! Each room boasts original art by Honduran painters that you will enjoy. Beautiful hardwood French doors open up to a spacious covered front porch were you will find a hammock calling your name out loud! Our accommodations in La Ceiba are all appointed with furniture made from certified local hardwoods which provide a true feeling of hominess that you will fall in love with. All of our rooms have a direct access to our lovely tropical gardens where you will find a variety of tropical hardwood and exotic fruit trees. Our tropical flowers naturally attract a variety of beautiful birds that will marvel you! From our gardens you have magnificent views to both Pico Bonito National Park and Nombre de Dios National Park. A variety of activities are available for your enjoyment. 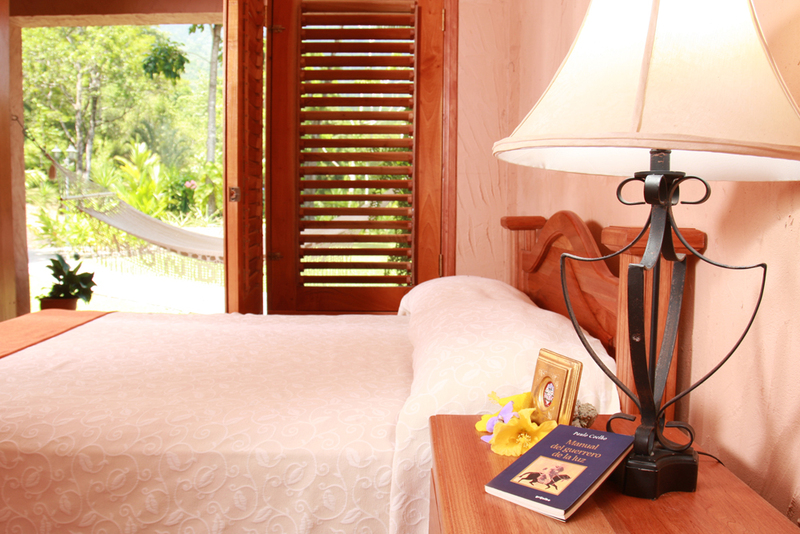 You will find that our accommodations in La Ceiba are absolutely unique and cozy. Rates for our accommodations in la Ceiba are quoted in U.S. dollars and include taxes and breakfast. Room rates are for single and double occupancy, and the extra person is an additional individual in the same room sharing beds. Up to a maximum of 2 extra persons per room are allowed. Low season rates apply from May 5th to December 20th, 2019. High season rates apply from January 6th, through April 12th 2019, and from April 21st through May 4th 2019. Peak season rates apply for Easter Week, April 13th to April 20th, 2019, and for the Christmas – New Year Holidays, specifically during the dates of December 21st, 2019 to January 4th, 2020.